Hi! My name is Brianne St. John. I have a wonderful husband and a son. 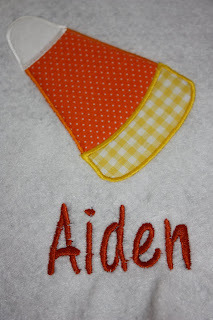 I wanted to get into embroidery and applique when I had my son. I was seeing all these cute outfits and I didn't want to pay the price tag that came along with them. So I got a machine and I have enjoyed it ever since. I take pride in my work and my house is smoke free. I have lots of designs and fonts. If there is anything you want that I don't have, I have no problem looking for the design. I have my own clothing that you can pick from or you can bring your own. I also do burp clothes and pacifier clips with velcro or nuk ends. It usually takes about two - three days to complete your order... if I don't have the size you need in stock I can order and depending on if Monag has them in stock it will take about a week to get the shirts. Everything is personalized for you and I will not accept returns. if I spell a name wrong or if for some reason a design starts to fall apart then I will replace it. Thank You! !